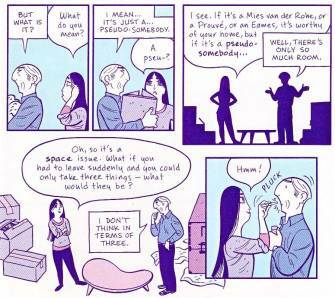 This isn't a review of Asterios Polyp but a guide to some of the material on-line that might help a reader better appreciate David Mazzucchelli's comic. That Asterios Polyp should be bought and read is to me indisputable. It is also true that this article will be of limited use to a person who has not read the book. There are a host of reviews on-line praising this book, but far less pointing out any perceived deficiencies. Careful consideration of both these viewpoints will lead to a greater understanding of what Mazzucchelli has achieved in this work. 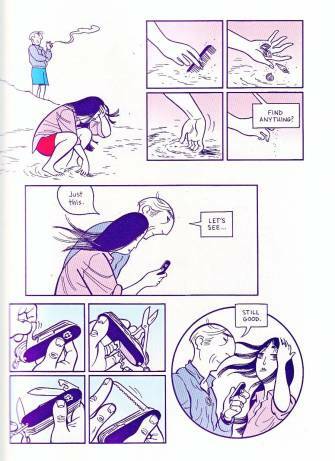 Mazzucchelli's work has close links to the European tradition in comics where a certain subset of artists have long produced comics replete with symbolism and metaphor. For example, there are the works of François Schuiten and Benoît Peeters on Les Cités Obscures, Miguelanxo Prado's Streak of Chalk and David B. 's L'Ascension du haut mal. Most readers would have recognized the ingenious allegories in a number of the Les Cités Obscures titles; less will have identified the Arcadian metaphors in Streak of Chalk if only because of its more realistic setting. 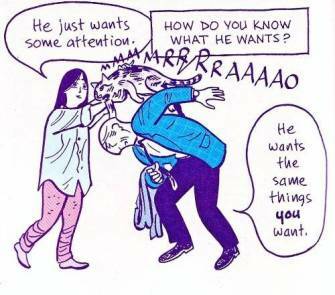 Readers of Asterios Polyp will often find a tension that doesn't always sit well between the more realistic, emotional pages and those that are focused on ideas, symbols and metaphors. It may be useful to compare the work at hand with Thomas Mann's The Magic Mountain, a novel of ideas that more skilfully hides its exact purpose. 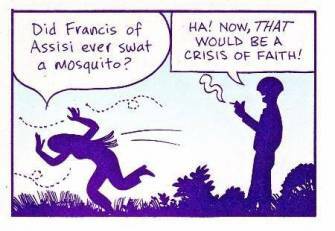 Criticism doesn't exist in a vacuum and even in these early days there have been a number of useful articles written about Mazzucchelli's opus. A good introduction to the work can be found in Douglas Wolk's review for The New York Times. Wolk proclaims the book "a satirical comedy of remarriage, a treatise on aesthetics and design and ontology, a late-life Künstlerroman, a Novel of Ideas with two capital letters." Later in his review he highlights a central characteristic of the book: "In one early chapter, that introductory image is a grid of 16 line drawings of an apple. The first interesting thing about those apples is that they're rendered in 16 distinct visual styles... The second is that the two colors on the page are solid purple -- which he uses rather than black throughout the book -- and cyan, neither of which are the color of actual apples. The point is clear: even while he's telling a story through representation, every line Mazzucchelli draws carries symbolic freight, and its iconic value may even outweigh its literal meaning." Another reasonably detailed look at the book can be found at The Savage Critic. Apart from the regular review bits summarizing the story at hand, Sean T. Collins tries to link some of the character designs to the long history of cartooning and has some comments on the use of colors in the book as metaphor. Collins also highlights a key section of the book that encapsulates Asterios' memories of his life with Hana. Over the course of seven pages, Mazzucchelli gradually increases the number of panels on each page -- from four to eight to 11 to 16 to 38 panels in a double page splash (which is suggested by panels that traverse the central fold of the book) and finally back to four panels -- all in an effort to mimic a flood of memories. 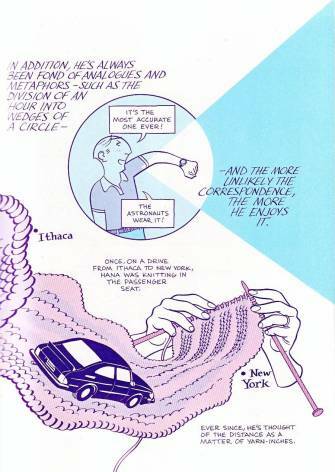 The central narrative seen through the center of each page is denoted by the color cyan showing Asterios' most cherished moment with Hana as he plucks a loose cotton bud from her ear. 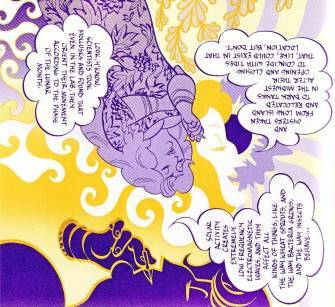 Further, Collins mentions the use of color, line and text to build up emotional tension during a pivotal argument between Asterios and Hana, the panel placements in the sequence here increasing the urgency of the narrative flow. 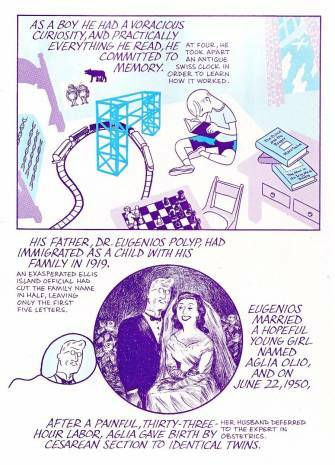 Scott McCloud's short appreciation of Asterios Polyp can be found at his website. Here the use of color as language, to mark time and emotion as well as its use in depicting the perceptions of the characters, their sense of isolation and their effect on their surroundings are discussed. On the same note, one might do well to pay attention to the distinct yet harmonious colors at certain junctures in the story, such as when Asterios and Hana meet for the first time. One might also consider why Giotto's St. Francis Preaching to the Birds is colored in such "depth" in contrast to the more distinct color separations at that point in the narrative. It's not surprising that McCloud should be so enamored of Mazzucchelli's book since a somewhat similar proliferation of styles and symbols populate McCloud's Understanding Comics. There is a superficial resemblance between the books in terms of formal "tricks" applied -- something that can be better appreciated by placing both books beside each other. Both are clearly works of artists who have thought long and hard about their chosen medium and Asterios Polyp presents itself as an excellent practical textbook despite being superficially at least fiction as opposed to treatise. McCloud brings up Mazzucchelli's use of space between panels but doesn't really explain what this space does to the narrative time. You can find McCloud's take on the gutter space between the panels in chapter three of Understanding Comics, but the discussion there has more to do with panel transitions than the actual aesthetic effect of varying the space between the panels. 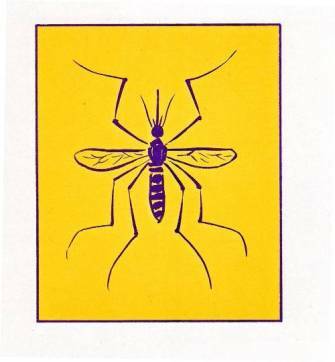 How this affects the reading experience of Asterios Polyp is less easily explained. It's obvious that the liberal use of space supports the compositional beauty of the pages as well as the pacing and readability of the book -- but what beyond that? Consider the final word balloon which would normally be attributed to Asterios but which actually belongs to Hana. Another site that seeks to provide some interpretive knowledge to readers is Stumptown Notes, which has reasonably detailed annotations of the book. The writer here brings up some similarities to certain sections of James Joyce's Ulysses. Mazzucchelli himself admits to taking inspiration from The Odyssey in his public interview with Dan Nadel, which can be found at Comics Comics. A number of allusions to The Odyssey (and by implication, The Iliad) are identified in the Stumptown annotations. I'll mention another obvious one: Willy Ilium (the Latin word for Troy) and therefore a sign-posted antagonist. Mazzucchelli uses this somewhat antagonistic symbiosis between the cultures of the Greeks and Romans to give expression to the duality in Asterios' life -- a point that is further driven home by the fact that Asterios is the product of a Greek father and an Italian mother. In addition, Asterios has a name of Greek derivation while his brother Ignazio's is possibly derived from Latin. 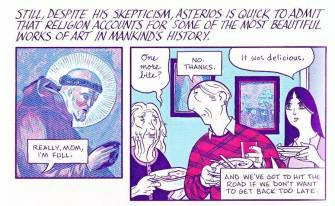 Mazzucchelli hammers home the duality present in Asterios' life and thinking with great persistence, particularly in the first half of the book. The annotator at Stumptown is equally assiduous in bringing these to light. For instance, he mentions "the ordered pairs" of Asterios' childhood -- namely the white and black chess pieces, Tweedledum and Tweedledee, Romulus and Remus, and the novels The Prince and the Pauper and The Man in the Iron Mask. Also coming up for mention is Asterios' birth date of June 22, 1950, "the first day of the second half of the century, thus missing out on the first half." In relation to this, I'll add another point: when one considers the designer furniture in Asterios' apartment (an Eileen Gray table, a Petit Loveseat by Le Corbusier, a Barcelona chair and Exposition coffee table by Mies van der Rohe, Marcel Breuer's Wassily Chair, an Eames Plywood Dining Chair and Lounge chair, a Prouve Gueridon dining table and a Bialetti Moka Express among others), it might be interesting to see how many of these design classics were created before 1950. "That name would have to have been Polyphemus, as in the Cyclops. Asterios himself is a metaphorical cyclops, lacking the ability to perceive emotional depth. Even his head is drawn as a two-dimensional construct: half a perfect circle, interrupted by two equally proportioned curves." There is less discussion, however, about how useful or aesthetically pleasing it is to have so many characters in the book thus named. While having one of the major female characters named after the Great Bear (with all its mythological import and physical descriptiveness) has its uses, it also removes the reader from any sense of reality. As such, Sean T. Collins' comparison of Mazzucchelli's work to those of Woody Allen and Philip Roth comes up short if only because of these instances of artifice and their ramifications. 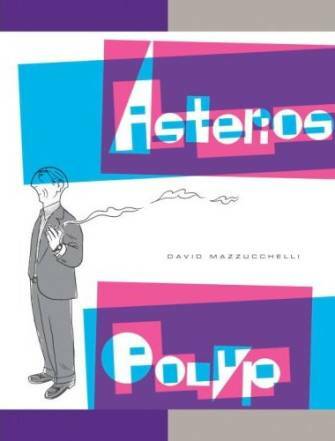 It's clear that the atmosphere in Asterios Polyp falls pretty far from the slightly exaggerated realism in both these authors' works, with the characters in Mazzuccheli's book representing ideas and types rather than fully fleshed out persons. In the eyes of certain readers, this heavy-handedness may be perceived as a failure on the part of the book. Herein lies the tension mentioned at the start of this article. There is every reason to believe that Mazzucchelli himself recognizes this, for he has Asterios emphasize the apparent differences between the factual (and honest) and fictional (illusory) early in his book. Later, in Asterios' first visit to Hana's studio, these dichotomies, as presented by the protagonist, are highlighted with a certain derision. Mazzucchelli's book is a manifestation of this tension, in its intellectual and narrative content as well as its physical presentation. Consider how the color separations on the dust jacket (as well as the cyan and magenta inside covers) give way to grey boards and purple binding. The cut away dust jacket is not mere affectation but a suggestion by the artist that one should look beneath the surface. Following Asterios' Orphic descent into the underworld -- which is a kind of resolution -- the narrative follows a more traditional narrative path with fewer digressions into theory. 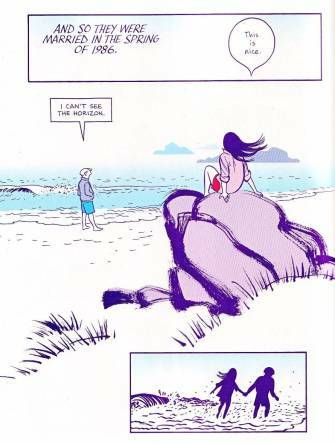 Mazzucchelli's themes may be laid out in unsubtle terms but the grand statements are mixed with some humor such as the mating of spermatozoan and egg as comic panels with Asterios' parents portraits therein. It is the gentle humor here and in other sections of the book -- such as Asterios' skewering of his architecture students or his wit and sarcasm in relation to Hana and her acquaintances -- the help to ameliorate the frequently didactic nature of the script. Nor have the lessons in storytelling learnt while working on his mainstream titles (like Batman: Year One) been set aside. The full-page bleeds mixed with panel inserts are liberally strewn about the current work as they were in his DC book (something which he eschewed in Born Again) negating any sense of intellectual claustrophobia. 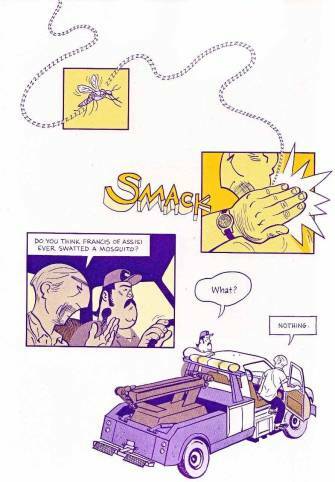 Asterios Polyp is a treasure trove of cartooning ideas, just as Dave McKean's Cages seemed at the time a robust dissertation on drawing, painting and art, and Chris Ware's recent works push the boundaries of representing time and space on the comics page. These technical achievements, however, only form part of the equation. The real worth of a work can only be properly gauged when one assesses how these tools have been employed in the aid of the story and how the narrative moves the reader both emotionally and intellectually. The marvel of Ware's work is how, for all its technical inventiveness, it remains an emotionally satisfying experience. 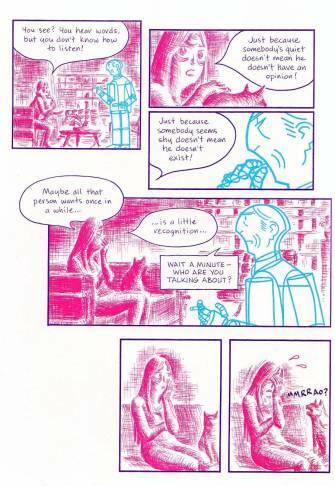 The denouement of Asterios Polyp is beautiful and lyrical but it is less certain to what extent the main body of the work has benefited from Mazzucchelli's immense talent for comics.